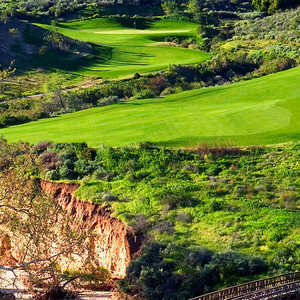 MOORPARK, Calif. -- Latest on the lips of Los Angeles golfers is scenic Moorpark Country Club, about an hour northwest of the city and neighbor to a handful of top-tier tracks like Rustic Canyon, Tierra Rejada and Lost Canyons, Pete Dye's 36-hole sloping behemoth just down the road in Simi Valley. Moorpark, better known for pick-your-own-veggies pastures, a golf mecca? Best believe it. Now 18 holes with another nine in the works for spring 2004, this Peter Jacobsen-designed roller-coaster wanders hither and yon like a dizzy wino looking for shelter on a frigid night. Surrounded by a budding development of million-buck homes, there are nonetheless some splendid views of rolling orchards and even a glimpse of the far-off Pacific on a clear day. Jacobsen and company made great use of land that might have stymied others, as gorge-ish as this hill country is. Vasty arroyos snake through the course, turning otherwise straightforward holes into cerebral exercises and opportunities for patient shot-making. You can ignore these sometime deep canyons and just flail away, but the risk of Big Numbers and twisted ankles just plain ain't worth it. After getting sent on your way by the starter -- Tall Tom as he is called, an affable and elegant giant -- you are facing trouble immediately, as the first fairway drops off steeply to the right and the left hillside is covered in tall, ball-devouring native grass. I banged two into the canyon before sanity prevailed and I hit three-wood safely to the short stuff, leaving an eight iron into the three-bunkered green. Note to self: at 357 from the blues, driver is not the club of choice. More trouble awaits, for now that you're on the pool-table slick, A4 bent grass greens -- which like a big-city woman are both fast and hard -- you best have brought your putting stroke with you. 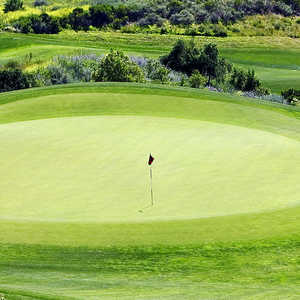 New greens like these are notoriously stingy and tough to hold, so it pays to club down and let her roll to the hole. A roomy fairway greets you on the par-5 third, a downhill 549-yard look that will entice you to go for the green in two, if you care to risk a descent into Dante's third arroyo from hell. Better to lay up and save your bravado for the approach to this shallow, wavy green. No. 5 is for the brawny lad, a par-5 checking in at 660 from the tips, beginning with a forced carry to a blind second shot, with the only good news being that the hole descends 170 feet from tee to green. Another gaping arroyo stares you down on the par-3 sixth hole, which at 224 yards is like salt in the wound after the Odyssean voyage that you just completed. The reward for such punishment comes on the far more verdant vistas of the back nine, where citrus orchards border the surrounding hills and dramatic elevation changes are the rule. The most memorable hole is the 419-yard 13th, with two forced carries and a dogleg left. If you negotiate the first canyon successfully, you'll be faced with a rather daunting approach over a stream to the steeply perched putting surface. In classic passive-aggressive fashion, Jacobsen then allows you a breather at the 14th, a drivable par-4 at only 270 yards from the elevated blue tees. Another Evel Knievel hole follows, the 183-yard 14th, which drops 100 feet from tee to green and where club selection in the face of swirling valley breezes is the key to the kingdom. The last three holes traverse a goodly chunk of real estate -- 16 and 17 checking in at 467 and 455 yards from the tips -- so save a little muscle for the end of the round. The 18th, at 511 yards, plays downhill some 170 feet from the tee, and invites you to gamble with a shorter route left that flirts with fairway bunkers, or aim for the more capacious right side, making it a three-shot journey to the the green. Not to get too gonzo on you, but I opted for the riskier left side, bombed a 3-wood from there to 35 feet from the flag and then drained the snaking downhiller for an eagle, the kind of finish that would make you come back for a second round even if the rest of the track was forgettable, which is one adjective you just can't hang on this place. My double-digit partners called the course "playable" and "lots of fun," adding only that they are inveterate walkers who regretted not being able to negotiate this schizophrenic terrain on foot. 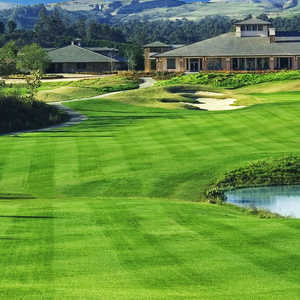 Aside from that, golfers of all skill levels will find Moorpark Country Club a more forgiving version of nearby Lost Canyons, where similar topography was given the Pete Dye once-over in what remains one of the toughest tests in the area. A 20,000-square-foot clubhouse is under construction and a spacious grass driving range is already in place. Eighty-three acres of wetland habitats have been set aside to accommodate the coyotes, deer and hawks that used to call this valley home before the big-ticket pads started rising from the mud. All in all, a proper balance has been struck between the needs of nature, golfers and the swank folks who will call this place home sweet home. Take either the 101 Freeway to the 23 Freeway North or the 118 Freeway West to the 23 Freeway South. Exit New Los Angeles Avenue (118) and travel West to Grimes Canyon Road and turn right (north) onto Grimes Canyon Road, and travel 2 1/2 miles to Country Club Estates (turn right onto Championship Drive). Golf lessons $35 per half-hour lesson, 3 lessons for $100. David Weiss, a Detroit native, divides his time equally between the worlds of golf and music. In the former, he was west coast editor and frequent contributor to Golf & Travel magazine, and in the latter he is known as David Was, half of the writing/producing team that created the band Was (Not Was).